The year is 2011 and towards the end of the year the date of 11-11-11 will be upon us. For those who were bought up, lived or have worked in Birmingham the Number 11 will have a significance. It is the number of the OUTER CIRCLE BUS route. I travelled on the Outer Circle as a child and a teenager to go to school in Bournville, to visit my uncle and aunt in Perry Barr, to play records with my mates in Kings Heath and to meet with my girlfriend (now my wife) in Acocks Green. I’ve always liked numbers and it came to my notice that there is a numerical coincidence this year. The date of 11-11-11. So the plan is to go around the Outer Circle on 11-11-11. Better still to start at 11:11 and to use a No 11 bus from my childhood! I’ve hired the bus and invited a few friends to come along for the ride, but there are over fifty seats on a 1953 double deck Birmingham City Transport bus. My invitation now is for anyone who is interested to follow this blog, or my tweets http://twitter.com/11_bus. This way your can find out how my plans are progressing, and how to get on board the OUTER CIRCLE BUS on 11-11-11. 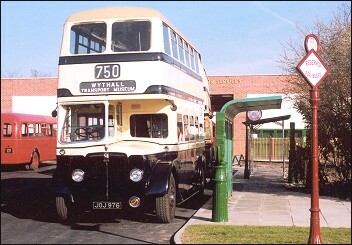 This entry was posted in 11-11-11 and tagged 11-11-11, 1950s Birmingham Corporation Double-Decker, Birmingham, Birmingham City Transport, Charity, Guy Arab IV, Outer Circle, Outer Circle Bus, Wythall Transport Museum. Bookmark the permalink. Simon – Thanks for the comment. Nothing strange, it’s just that there is so much information to collate and present that I am not able to do everything at once. I am aware of Jon Bounds’ 11-11 and will include something on the blog when I get the opportunity. If you have any other information or observations regarding my 11-11-11 project please let me know. At the moment November is relatively a long way off and I do have a “day job” (well 2 in fact! ), so finding time for everything at the moment can be difficult.